In Part 1 of this series I showed a 66.6% increase in warming trend of Australian annual minimum temperatures caused by adjustments to the ‘raw’ data. 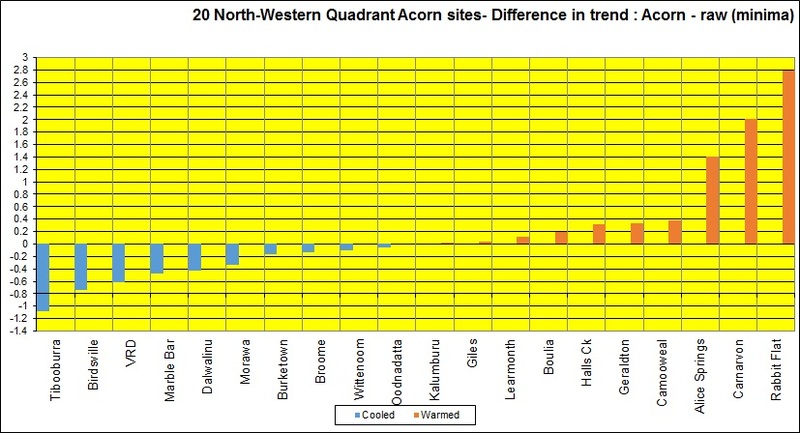 This was based on analysis of 83 of the 104 Acorn sites, as I restricted my study to only those sites with at least 24 months overlap between old and new stations within 30 kilometres. I now turn to the remaining sites. These remaining sites all have records less than the full 103 years, as I only use the longest available record from a single site, with no splicing to form a composite record. I truncated Acorn and ‘raw’ annual data to exactly the same start and end dates. Trends calculated over these shorter periods are therefore exaggerated. As well, some of the records show enormous gaps. 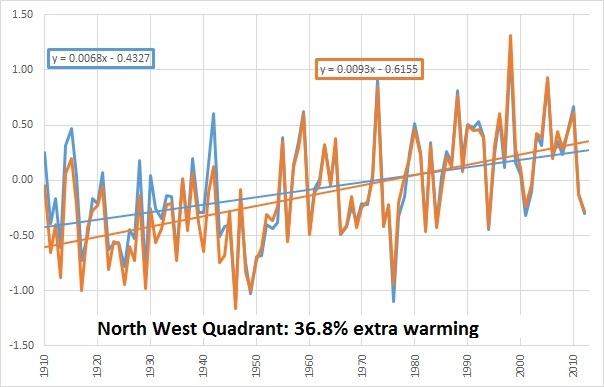 Trends calculated for these sites showed much less warming bias than the 83 I first analysed: the mean difference in trend was +0.26 C, or 26.7% increase. This is not a meaningful metric, however. The crucial measure is the effect of the adjustments across the whole network. 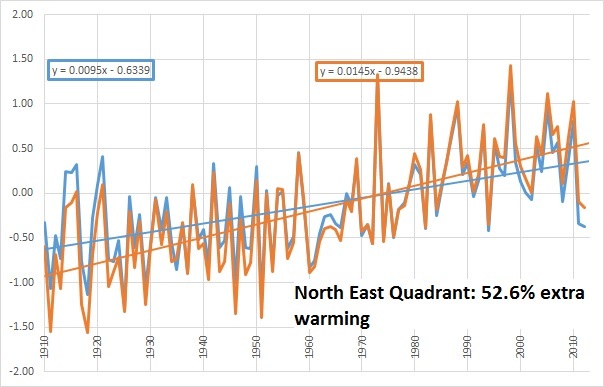 To do this, temperature data must be converted to anomalies from the 1961-1990 mean. 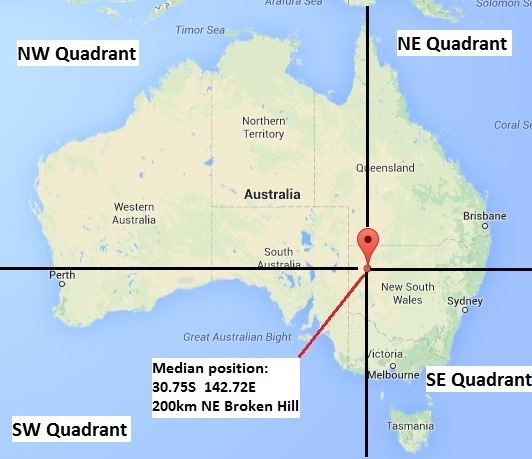 This meant the loss of Tennant Creek PO, which has insufficient data in this time period. Here, then, is the result for 103 of the 104 Acorn sites. 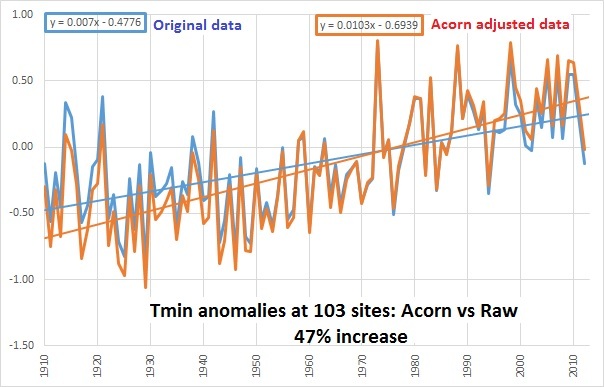 Figure 1 shows the straight mean of minima anomalies for the 103 sites for which data can be compared, ‘raw’ vs Acorn. 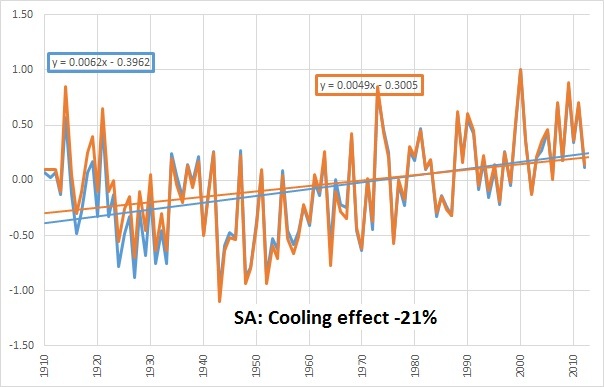 The adjustments to the ‘raw’ data have the effect of increasing the trend in minimum temperatures from +0.7C per 100 years to +1.03C, or 47%. Going by this plot, the increase is by nearly half rather than two-thirds- still embarrassingly large. However, large slabs of data are missing or unaccounted for. 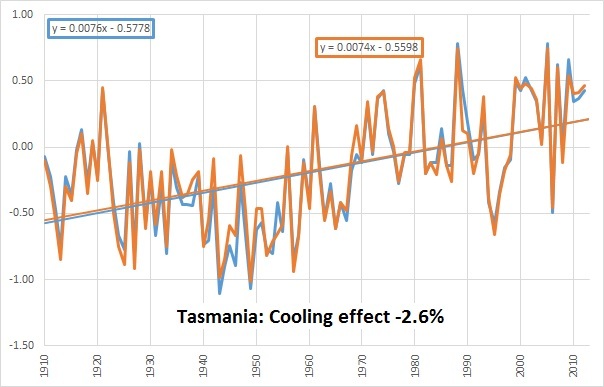 I have zero confidence that the trend in minima is +0.63, +0.7, +1.0, or +1.03, or any other figure, and an average trend for Australia is meaningless given the wide differences in different parts. 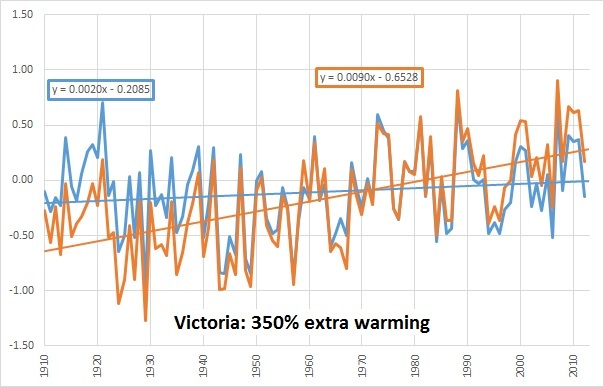 By the way, with no stations missing, the warming bias in Victoria is still +350%. In my next post I will look at some of the ‘outlier’ sites with very large differences in trend. 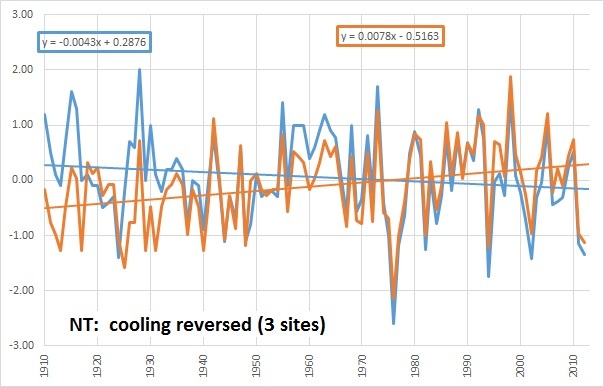 In my last post I showed how a numerical near-balance of adjustments to the ‘raw’ minimum temperatures at 83 out of 104 Acorn sites resulted in a 66.6% increase in warming trend across the nation. I now turn to the effect on state and regional temperatures, which is enormously varied. Note the little “bulls eyes” in various places, indicating where the local trend at individual sites is out of sync with the wider trend. I’m sure you can identify Tibooburra in north western NSW, Richmond in northern inland Qld, Rutherglen in Victoria, Marree in northern SA, and Carnarvon on the WA coast. 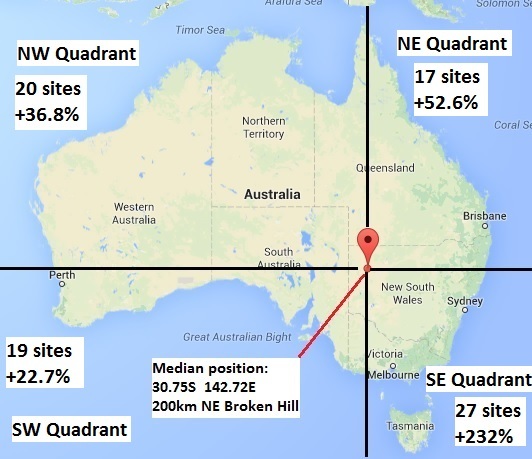 Figure 2 shows the median position of all 104 sites, the four unequal area quadrants, and the number of sites I analysed in each with the increased warming resulting from adjustments. 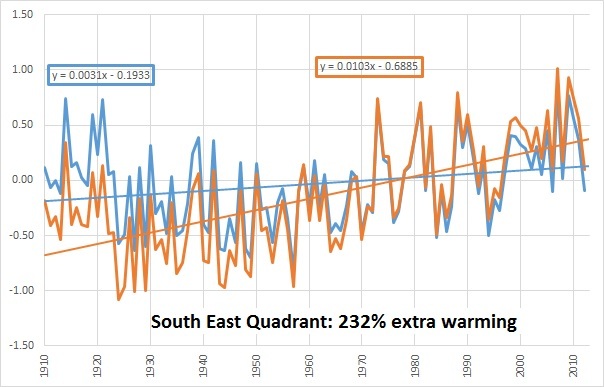 The concentration of Acorn sites in the south east of Australia, and the concentration of warming adjustment there as well, is plainly obvious. Now I shall show each quadrant in turn, showing the trend difference at each site. In the next section I look at how the adjustments affect the mean minima in each state. 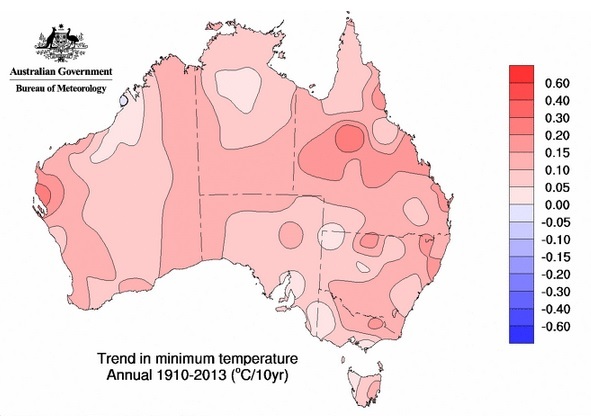 First I’ll look at the Northern Territory, which is atypical and based on only three sites (Alice Springs, Victoria River Downs, and Rabbit Flat), the two last with less than 50 years of observations. 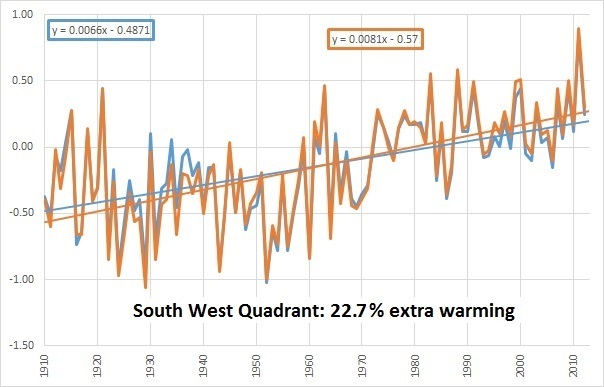 Figure 14: Western Australia- 23.7% increased warming. 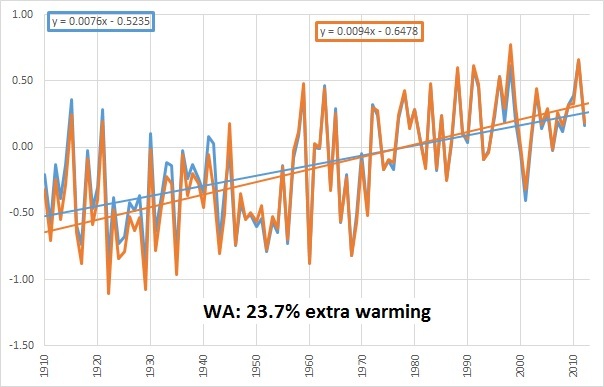 So far, every state has seen an increase in warming much less than the national mean of 66.6%, so much depends on the final two states. 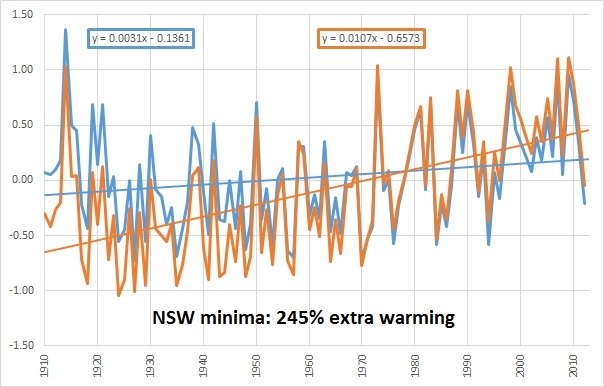 Figure 16: New South Wales- 245% extra warming! That is pretty amazing, but the result for Victoria is even more astounding. The implications for the trend map in Figure 1 are obvious. One hopes that those adjustments are well and truly justified! In the next post I will discuss the remaining 21 sites which I am unable to compare directly, and later, the trend outliers. You are currently browsing the kenskingdom blog archives for June, 2014.